Our posters are digitally printed on 8 mil photo paper (52 lb.text). They can be encapsulated in lam (Thermal “Hot” Lamination – Gloss in 3 mil. Thermal lams encapsulate your art in the lam, top and bottom to help protect it and makes the print thicker and more rigid) and can also be mounted to different materials. All are printed with outdoor UV solvent inks that are warranted against fading for up to three years. All printing is custom and is priced per sq. ft. in sizes from 1 sq. ft. up to as large as 60” wide x any length. Below are prices for standard size posters if different size is needed please contact us. 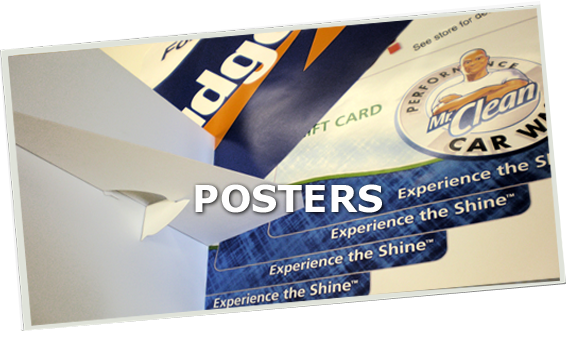 See our Display Stands to hold your 22″x28″ posters. Fatheads made from your photo. These are about 18″ wide x 36″ tall, including the handle that is about 12″ tall. 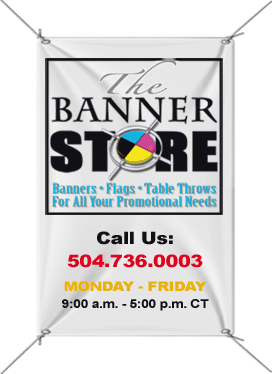 They are mounted to 3/16″ coroplast (plastic cardboard) Full color digitally printed with school name on handle and die-cut. Selfie Frames are 18″ wide x 22″ tall, in any color with the name of the event at the bottom of the photo. They are mounted to 3/16″ coroplast (plastic cardboard). Full color matt digital print mounted to either 3/16” Foam Core, 3/16” Coroplast or .o4o Polystyrene. Prints can be any size from 1’x1’ to as large as 4’x8’ must ship flat. Below are prices for standard size posters if different size is needed please contact us. Lamination is NOT included but can be added as a option. The top lamination is a UV Cold Over Laminate– 3 mil Gloss lams are what we use when mounting prints to boards for extra protection against scratching and UV light. 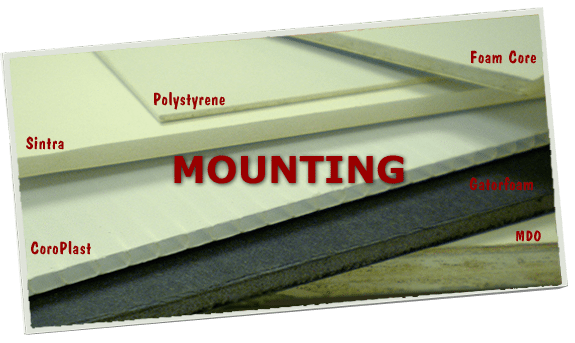 3/16″ Foam Core – Consists of foam laminated on both sides with white clay coated paper. This lightweight material can be used for a wide variety of graphic arts applications including point-of-purchase displays, exhibits, and signs. Because it is a paper product this material is best used for inside use. 3/16″ CoroPlast – (cardboard made out of plastic) it is sturdy plastic sheeting extruded from either polypropylene or high density polyethylene. It is more durable than corrugated fiberboard, lighter in weight than wood and solid plastic sheets. Its fluted ribs support both surfaces, it light weight, tough and abuse resistant. Additionally, it is both chemical and water resistant making it an idea choice for numerous outdoor commercial and industrial applications. Polystyrene – .040 is a lightweight flexible plastic material. This material is both chemical and water resistant making it an idea choice for numerous outdoor commercial and industrial applications. Black Gatorfoam – 3/16″, 1/2″, 3/4″, is a lightweight structural panel consisting of a rigid polystyrene foam core faced on both sides by a smooth, moisture resistant sheet of solid polystyrene. The foam and facers are permanently bonded together. These boards are rigid and lightweight making them an excellent choice for signage, photo mounting, exhibits, and point of purchase displays. Because it is a paper product this material is best used for inside use. 3/16″ is standard for premium mount prices below, if thicker is need please call or e-mail for pricing. White or Black Sintra – 1/8″, 1/2″ is an expanded PVC foam board with a matte finish. It is lightweight, durable, chemical resistant, has fire retardant capabilities, and is available in a variety of colors in 3mm. It is an excellent substrate for point-of-purchase displays and signs. Sintra is also chemical and water resistant making it an idea choice for numerous outdoor commercial and industrial applications. 1/8″ is standard for premium mount prices below, if thicker is need please call or e-mail for pricing. 1/2″ Coroplast – – (cardboard made out of plastic) it is sturdy plastic sheeting extruded from either polypropylene or high density polyethylene. It is more durable than corrugated fiberboard, lighter in weight than wood and solid plastic sheets. Its fluted ribs support both surfaces, it light weight, tough and abuse resistant. Additionally, it is both chemical and water resistant making it an idea choice for numerous outdoor commercial and industrial applications. UV Cold Over Laminates – 3 mil Gloss lams are what we use when mounting prints to boards for extra protection against scratching and UV light. Thermal (Hot) Lamination – Gloss in 3 mil, 5 mil and 10 mil. Thermal lams (hot lams) encapsulate your art in the lam, top and bottom to help protect it and makes the print thicker and more rigid. Grommets – Brass grommets that go thru the outer edge of the material for hanging. Webbing – It is like seatbelt material. When placed across the top and bottom it will add a lot of extra support on larger and heaver banners. D-Rings – When sewn into webbing give an extra strong method of support to large, heavy banners. Wind Holes – Half circular cuts thru the banner material to help relieve the wind load, because they allow the wind to pass thru. Velcro – We can add male or female Velcro around the outer edge of the material as needed for hanging. Easel Backs – For posters that are mounted, we have different size easels depending on the size of the poster.